These two Moomin stories right in the middle were the best ones, in my opinion, and the two that I most enjoyed and am most likely to reread often. Perhaps this is because they both feel a bit lighter, and have a wider cast of characters. They feel funny and charming, and they both feature my favourite character in all of Moominvalley, Little My. In Moominsummer Madness, there is another pesky flood. 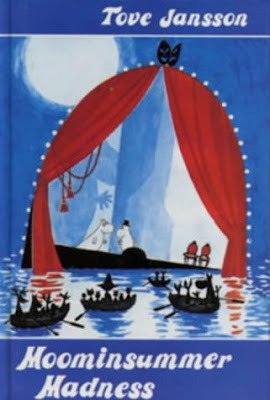 The Moomins end up finding a temporary home in what turns out to be a floating theatre. There are mistaken assumptions, new friends, humour, and the best ever image of Little My floating down the river in Moominmamma's sewing basket. Alongside the Moomin family we follow the adventures of Snufkin, Little My, the Hattifatteners, the Fillyjonk, Hemulens, Mymble and more. We really get to see a wide variety of the characters Jansson created, and learn more of Snufkin's hatred of park keepers and his unexpected talent for babysitting. This one is so surreal and charming and such fun. It was the first Moomin book I read, as I own it in hardcover, and then reread as I was trying to follow the series order. I really enjoy this volume. 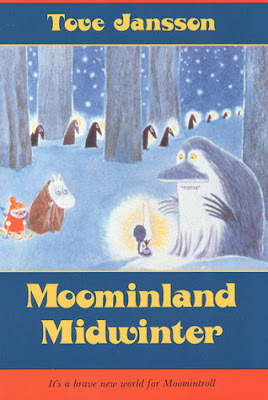 Moominland Midwinter is almost the exact opposite, both seasonally and structurally. It focuses on Moomintroll and Little My, the only two members of the family awake during the winter season -- Moomins hibernate, you see. Little My is her usual pugnacious self and throws herself into winter sports. Moomin wakes unexpectedly and experiences a cold and quiet time of year without his usual friends and relations (aside from Little My of course). There's the Groke, and the poor squirrel who encounters it; there's Too Ticky who is spending the winter in the Moomin's boathouse, and the creature who's living in her closet. And the Hemulen who skis over to Moominvalley and tries to organize jolly winter sports because that's what Hemulens do -- they are very extroverted and participatory. Poor Moomintroll must find his place in this strange winter land, and wonders if he should wake up Moominmamma or just go back to sleep himself. It's a new look at Moominvalley, and a very enchanting one at that. These two together make a satisfying and complementary read. I'd definitely recommend reading them together, and visiting Moominvalley in all seasons. In Moominsummer Madness, it's Snufkin who finds Little My in the river, and he tucks her into the brim of his large hat to travel along with him. From that vantage point, Little My makes her usual sarcastic and straightforward comments. 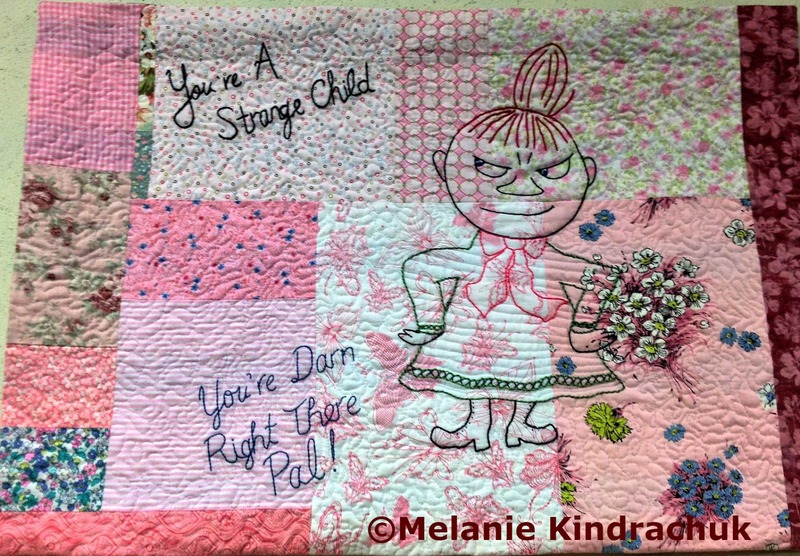 It's one of their exchanges that inspired a wall quilt I made featuring Little My. You can tell I'm a fan.